Hoya endauensis was discovered in 1985 and published by Dr. Ruth Kiew a Malaysian botanist in 1989. Dr. Kiew is a renown plant scientist primarily specializing in begonias and African violets. The plant was found on the river banks of the Ulu Endau River in Johor, Malaysia. It grew in the shade and is considered to be very rare and endangered in its native habitat. It was named for the river in which it was found. I obtained two different specimens of Hoya endauensis in the summer of 2013. One was obtained on Ebay from a Florida vendor and one was obtained from Joni at SRQ Hoyas. I struggled with both plants and eventually lost the one from Ebay. The one from Joni was maddening as well; as soon as it would start to grow a little, I would get excited, it would stop and die back sitting there for months before it would try to grow again. I assumed that it was a watering issue, and I tried various watering regimes never getting it right. My remaining specimen of Hoya endauensis was growing in a tent with LED and T-5 lighting. It would occasionally grow, but spent most of its time sulking. 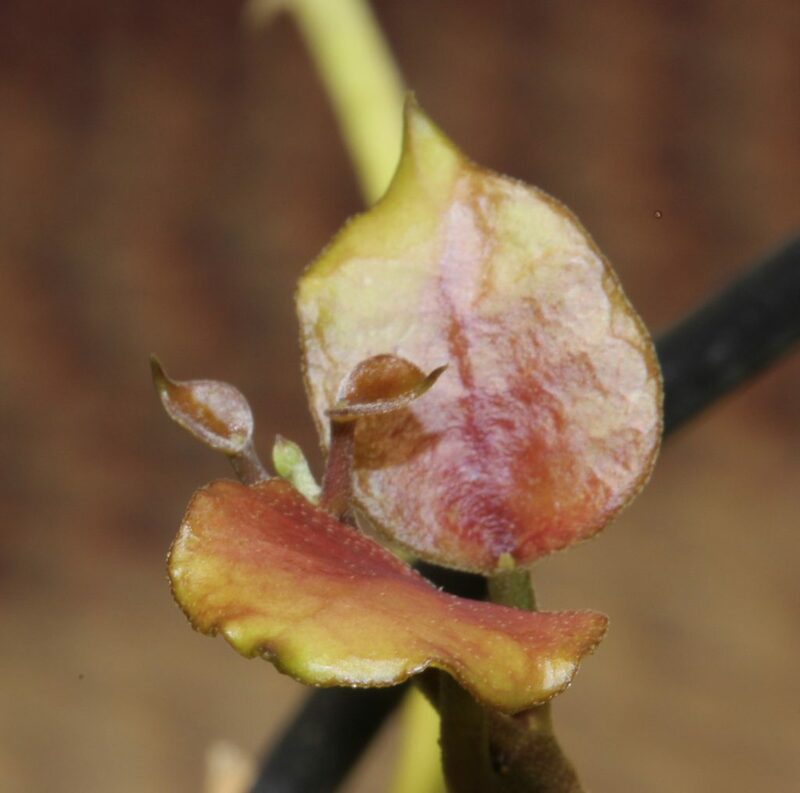 Then in the spring time of 2016 after a particularly long period of growth (mostly vine with only a couple of leaves), it grew a peduncle and started to bud up. I was so excited, and then I watered the plant â€“ the next morning the entire peduncle fell off! I was ready to throw the entire plant into the trash! After the catastrophe of losing the peduncle, rather than succumb to my immediate desire to throw out the plant, I moved it to another tent. The new tent was lighted with a single T-5 fluorescent bulb and a small 150 watt HPS grow light. It was much warmer than the other tent with temps regularly exceeding 90°F (30°C). It was also very humid. I also started using a product called Recharge, which contains beneficial microbes and bacteria along with a sea weed fertilizer. All of the extra warmth, humidity and organic products seem to help the plant greatly. It started to grow again, and the existing leaves seemed to start looking healthier and darker green. Within a month of moving the plant, it grew another peduncle and this time it started to bud up and the buds actually grew! I watched it every day, and this time they held and finally opened up about one month after I first saw the tiny buds. If you are looking for a challenge, I can highly recommend this plant, as it will test your growing skills every step of the way. I cant really give this plant a thumbs up for beginners, or anyone who lives in my neck of the woods, unless you have grow tents or terrariums where you can give it the conditions that it requires.